Abe George quit after claims of sexual harassement. BROOKLYN — A former political rival to Brooklyn District Attorney Kenneth Thompson who later became a high-ranking official in his office quit after being accused of sexually harassing a prosecutor who worked for him, DNAinfo New York has learned. 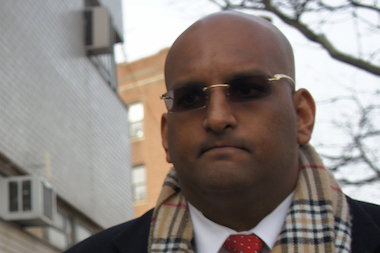 Abraham George, a former Manhattan assistant district attorney who ran against Thompson last year before scuttling his campaign to support him, was accused of trying to kiss another ADA while they were out dining following an evening working at night court. She immediately rebuffed George’s overture, sources said, but didn't file a formal complaint, apparently because she was fearful of repercussions for complaining against her boss — one of five deputy chiefs in the Major Narcotics Investigation Bureau. The 28-year-old woman, however, did mention the incident to a friend, who in turn told another prosecutor about it. Word eventually reached Thompson, who ordered an investigation. The woman, who has worked as an ADA for a few years, confirmed the incident for investigators, but asked that George not be punished, sources said. She asked only that the DA sign off on a previous transfer request she made to go to another division, which was immediately granted. George, 36, meanwhile, insisted he only made a move on her because he believed she was interested in him. “[Thompson] concluded that the female assistant DA was being truthful and accurate, and at that point [George] was reprimanded,” a source said. The DA initially told George that if he violated any other office conduct code he would be immediately fired. The victim was said to be satisfied with the reprimand, sources said. But the new division the woman was transferred to was on the same floor as George's, and that made her uncomfortable — a fact that prompted Thompson to consider axing George completely. When Thompson told George he wanted him moved to another floor, George balked, saying it would make him appear guilty unless he moved to the 19th floor, near Thompson's own office. Thompson refused and told George he would be fired immediately if he did not accept a transfer. On Thursday this week — the day after Thompson spoke to him and an "On The Inside" inquiry — George announced he was taking a job as general counsel to an organization that helps wrongfully convicted inmates win their freedom. “I am proud to have supported our current District Attorney Kenneth P. Thompson as part of his transition team and in the last year working as a Deputy Bureau Chief in his office,” he said in a statement. He made no mention of the sexual harassment issue and did not return a call seeking comment. When Thompson hired George to be a deputy bureau chief, both he and George insisted there had been no deal for George to support Thompson during the election campaign in exchange for a job.